The Monte Verde is a general region, therefore it is best to stay at the nearby town, Santa Elena, which is essentially 3 roads which form a little triangular town. 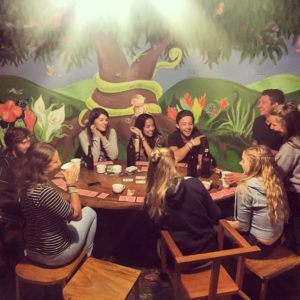 My favourite hostel in Santa Elana is Monte Verde Backpackers . They are central, have free breakfast, friendly staff, a supermarket 30 seconds walk, and a kitchen (which means a fridge to store your booze! Total essential). They offer great tours at super affordable prices too. Other places include the Sloth Backpackers Hostel , which is also central and also includes breakfast. 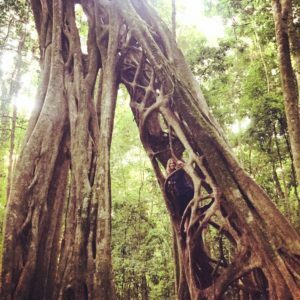 The Treehouse Restaurant is definitely an experience you should try. This little cafe/restaurant is nestled into a tree. A whole tree. It is rather expensive (for Costa Rica) so it may be a good idea to go and just order a coffee and experience dining in what is essentially a massive cubby house. Taco Taco is a fantastic local hangout, which sells, you guessed it, taco’s! Yum and super filling. Head here for a quick meal at a cheap price. For a vegetarian meal check out Paz Y Flora Vegetarian Restaurant. This place has some damn good meals and a beautiful little restaurant. Also check out The Garden of Eden for some delicious vego food. It is a little bit further out of the triangle to get to but make sure you take a path if you go at night so you don’t get hit by any oncoming traffic! Be warned the path from the main Santa Elena triangle to The Garden of Eden is up hill, but this is good because you can work your appetite up! The local soda’s are always a good idea to eat at anywhere in Costa Rica to get an authentic dish and for super cheap. They usually serve the typical dishes, like Gallo Pinto and Fried Plantains. Santa Elena is not a big drinking town, however that’s not to say you can’t have a good time! I’d recommend getting the party started at your hostel with some beers and wines from the supermarket and get some getting to know each other drinking games going! Best way to meet some fellow travelers and locals. If you need to do a bit of dancing head to the best (and I think maybe the only…) bar in Santa Elena, Bar Amigos. Zip Lining: I’m sure you’ve seen pictures of Monte Verde, well yes. It looks exactly like the pictures. Your hostel will recommend plenty of tours for you to try, so have a look at whats on offer and what suits your budget/ liking! I would highly recommend the 100% Aventura Canopy Tour. It was epic. Beginners do not stress, you will be well taught by the professionals all the necessary safety and fun tips on how to zip line over the jungle on a series of cables. They start you out on a few super short cables so you can get used to the feeling, and then you get to the real good stuff! There is honestly no feeling like flying through the sky with nothing but jungle far beneath your feet. 100% Aventura also gives you the opportunity to do a ‘superman’ canopy, definitely do it! This was my favourite of the cables, as you are strapped on by a chest harness (instead of a harness around your crotch, like with rock climbing and the previous cables) and you can fly through the air like superman on the longest zip line in Latin America! 100% Aventura ends their tour with a ‘Tarzan Swing’ which was the most scary part of the tour for me (you do not have to do it, but you should!). I am so glad I committed to the swing, as it was an incredible experience! You free fall for around 3 seconds (which feels like 3 minutes) and then the swing catches you on the cables you are attached to (from your crotch harness) and you fly back up into the air and swing a few times before they lower you back safely on the ground. It was an absolutely incredible experience, similar to sky diving however without the risk of damage to your neck. I would 100% recommend 100% Aventura! Coffee & Chocolate Tour: A little less adrenaline tour is the coffee and chocolate plantation tour offer by Don Juan Coffee. This tour was absolutely amazing. The owners take you through their plantation, explaining the different methods of production and answer any question you have ever had about coffee or chocolate. The guys here are really passionate and genuine which made the tour a million times better. After your education, you can taste firsthand their work, which is absolutely deeeelicious. Included in the afternoon tour is a nightlife walk, which was a real highlight. The guides were very knowledgeable about the animals and how to find them. We ended up finding heaps of animals including sloths, hairy dwarf porcupines, spiders, a toucan, frogs and heaps of beautiful little insects. I would highly recommend this tour, it was a real highlight in Monte Verde. There are plenty of other tours offered including Canyoning Tour (which my sister loved), Walking Tours, and Bungee Jumping Tours. 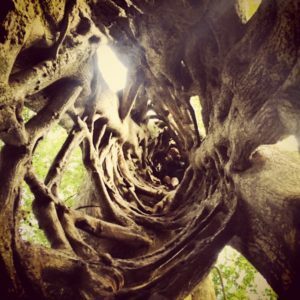 Local Ficus Tree’s: These tree’s are insane. They are so beautiful with their winding trunks. There are 2 in particular that are worth going on an adventure to find, and that are not in any guide books that I know of! 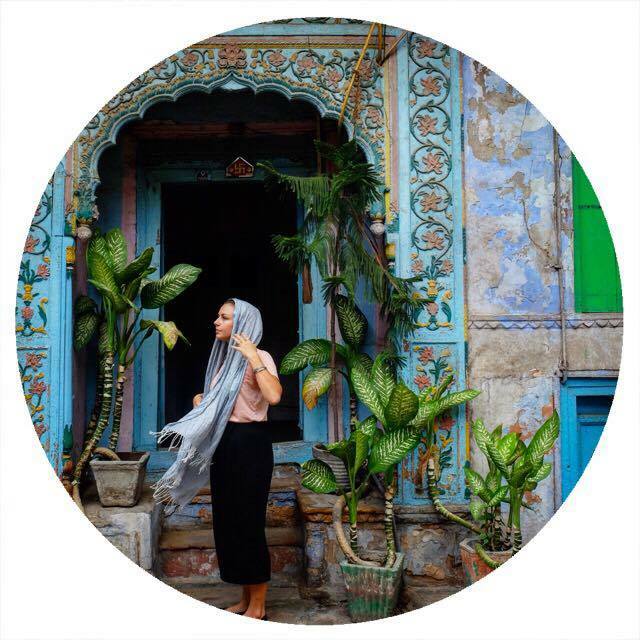 Images taken and owned by Ashley Nissen, check out her adventures on Instagram here.